In this article, we will checkout 2 best free Origami Simulator software for Windows. These software let you simulate different types of origami to help you learn origami step by step. The best thing about these software is that you get pre-loaded origami designs. So, you do not need to bother about loading any kind of external file(s). 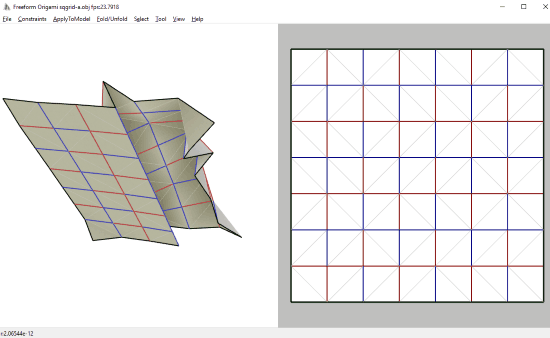 After opening an origami file, these software let you simulate the folding pattern of origami. You can view step by step how an origami folds. You can also rotate an origami freely to exactly see how a model is being developed. Let us checkout both these origami simulator software in brief and see what all they have to offer. In case you are looking for an online origami simulator, you’ll find one here. Origami Editor 3D is an open source origami simulator software for Windows. It is basically an origami editor, which you can use to simulate origami. Although you can create or edit origami files here, we will not be talking about that in this article. We will focus on origami simulation. There are many pre-loaded origami files in this software. Just go to Files menu, then click on Example Figures. Here, you will find more than 30 origami figures that you can simulate. Click on any origami to load it on the interface. As you can see, the interface has two windows. One window gives the 3D view, while the other shows crease pattern of origami. Notice the slider at the bottom of the interface? That is available there for simulation. Move it towards right and you will notice the paper in 3D window being folded step by step. In the 3D window, you can drag and rotate the 3D origami to closely view how it is being formed. This simulation makes it easy for the learner to know how to fold origami step by step. You can even export the rendering as PDF or as plane or animated GIF. Get Origami Editor 3D here. 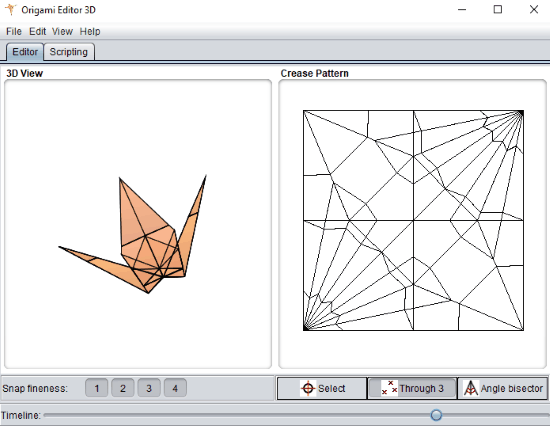 Freeform Origami is another free origami simulator software. It also has pre-loaded origami files, but they are in limited number as compared to Origami Editor 3D. You will find 14 origami files here. The supported file formats in this software are DXF and OBJ. Unlike the above mentioned software, you cannot create or edit origami files here. To simulate an origami, you need to open one first. You can do so from File > Open. Here, you will find a list of origami files, which you can open by selecting. The 3D origami loads on the screen by default. You can also view crease pattern of origami side by side with 3D render. For this, go to Constraints menu and select the Developable option. To simulate the origami, go to Fold/Unfold menu and select Fold option. To fold and unfold, hotkeys have been assigned as well. You can rotate and view the 3D model freely by dragging it using the right click of the mouse. You can try out Freeform Origami here. These were some of the best origami simulator software out there that will help you learn origami step by step.